The simplest of all frys,the recipe especially useful for newly cooking ,and bachelors who cook themselves. well thoroughly washed,peeled and chopped into small pieces. 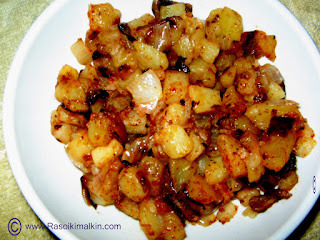 Place a pan on the stove,add oil ,after heating add chopped potato pieces and fry, after frying for 5 min add coarsely chopped onion ,and garlic flakes(optional)and fry till golden brown. Then add salt and after finishing add 1st or 2nd variety of redchilli powders. You may add seasoning of mustard and jeera,immediately after placing a pan and oil,and before adding aloo.